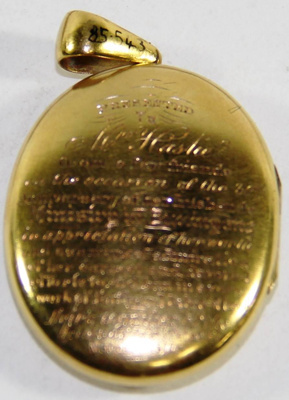 About this objectOval locket with wide-keeper. Front has diamond-shaped design with central square of blue enamel work with pearls in points and diamentes on each square point. Reverse inscribed with long tribute. Inside is a portrait of Rev. T. Hastie. Inscription and MarksPresented to Mrs. Hastie from a few friends on the occasion of the 30th Anniversary of her Husbands Ministry in Buninyong in appreciation of her worth and as a mark of admiration of her earnest and devoted efforts to aid him in every work of Faith and Labor of Love. Heirs Together Of The Grace Of Life 1 Peter 3.7. March 27th 1877.